After years of testing, Gmail has finally added a very useful security feature: tracking open sessions. 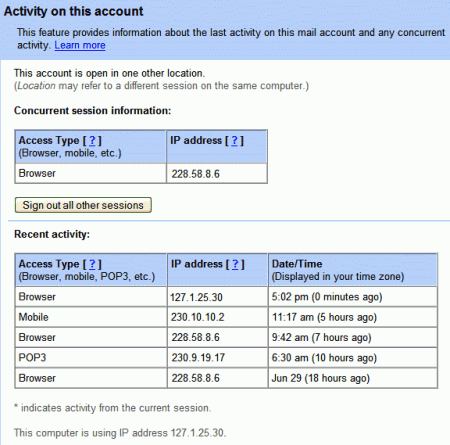 If you log in to Gmail from more than one computer and you forget to sign out, you'll be able to see the list of locations where your account can still be accessed. Until now, the only solution when you forgot to log out from Gmail after using a public computer was to change your password. Otherwise, anyone could access your account without knowing the password. Now you can sign out remotely from all the locations where your Gmail account is still open. If you click on "Details" in Gmail's footer, you'll find a lot of interesting information about your sessions. "The top table, under Concurrent session information, indicates all open sessions, along with IP address and access type -- which refers to how email was retrieved, for example, through iGoogle, POP3 or a mobile phone. The bottom table, under Recent activity, contains my most recent history along with times of access. I can also view my current IP address at the very bottom of this window, where it says This computer is using IP address...". This could be useful if you want to find whether someone else has access to your account: you'll be able to find the IP address and the date of the most recent activity in your account. Gmail's blog mentions that this feature is currently being rolled out in the new version of Gmail, so you may not see it right now. Google AdSense, PayPal and orkut are three other services that show the time of your last login so you can protect against abuse, but Gmail's new feature is much more advanced. Among the things you can do to protect your Gmail account, it's a good idea to sign out after reading your email, not to select "remember me" when you log in from a public computer and to choose a good password that should remain secret.